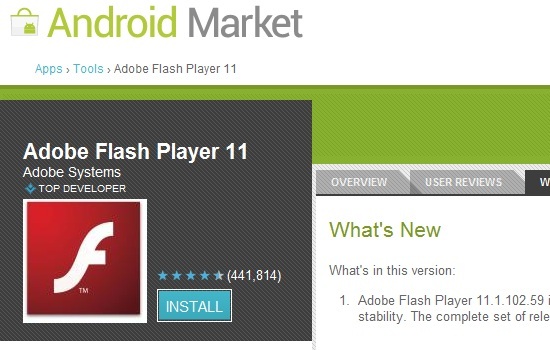 Contrary to popular belief, Adobe does not dislike HTML and the Adobe Flash Player for Android, BlackBerry PlayBook 11.1 update is going to be the last from the company. Since major mobile devices happen to be offering support for HTML5, it is apparently the best solution for content distribution across mobile platforms. All of this works out to the headlines that Adobe is going the HTML5 way and the guys over at Apple are probably sitting around sporting smug smiles across their faces. Well, it’s been coming for quite some time now and it was just back in July this year when ABI pronounced that ‘the disappearance of Flash is close than people think’, while predicting that 2.1 billion HTML5 browsers would make it to mobile devices by 2016. “Part of Adobe’s story is enabling cross-platform solutions, but since Flash has never been supported on iOS, we weren’t able to deliver on that vision in the context of mobile browsers. With mobile browsers as good as they are now (the ICS browser looks amazing, and mobile Safari has always been awesome), it just makes more sense to use HTML,” says Christian Cantrell, Adobe AIR Application Developer, Product Manager. So in defense of Adobe, Cupertino never really gave it a chance of establishing any sort of ubiquity across mobile platforms owing to the lack of support for Flash on iOS devices. The official Adobe blog insists that the company will work with big names in the HTML community including Google, Apple, Microsoft and RIM over advancing this emerging web standard for the mobile platform.